Thank you for visiting my website. Please stay awhile and let me introduce myself. As a lifelong musician, composer and teacher and recording artist I have developed an eclectic musical style that has led to a variety of invitations to share my music. You may sample music from my ten recordings elsewhere on this site. If you like what you hear perhaps you will make a purchase. You may also look at the schedule of my upcoming performances for an opportunity to enjoy it live at a nearby venue. While I love to compose, give concerts and provide music for worship, a good deal of my playing is for weddings throughout the Tampa Bay area. Many of them are destination weddings; couples who live out of the area and come to Florida to fulfill their special wedding dream in Paradise. My battery operated sound system allows for just the right amplification for guests and the approaching bridal party. Of course there are many historical churches and buildings throughout the Bay Area that welcome wedding couples. Some of my favorites are the Mirror Lake Lyceum in St. Petersburg and the historical church in Heritage Village, Largo. Traveling up the county consider St. Andrews Memorial Chapel in Dunedin, the Reba Sutton White Chapel in Palm Harbor and the Unitarian Universalist Church of Tarpon Springs. The beautiful Sunken Gardens in St. Petersburg and the Botanical Gardens in Largo serve as lovely floral backdrops for wedding ambience. There are so many beautiful places in Tampa Bay that I can recommend a couple seek out for the wedding destination. I would love the opportunity to become your wedding harpist. 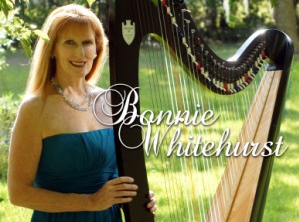 On my site is a Youtube video of many of the popular songs a wedding harpist is asked to play. Learning out of the ordinary music requests is one reason I do so many weddings. Playing other instruments and singing is always an option as well. Allow me to play the music for your wedding that helped bring you together.